Winship Deputy Director Suresh Ramalingam, MD, has been elected to the American Society for Clinical Investigation. 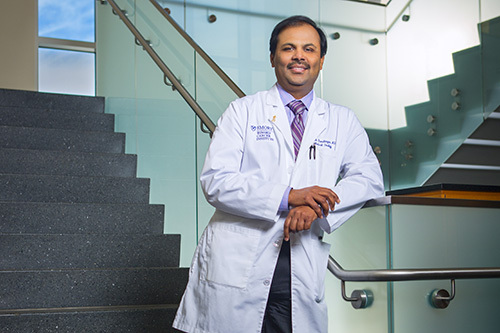 Suresh Ramalingam, MD, deputy director of Winship Cancer Institute of Emory University and assistant dean for cancer research in the Emory School of Medicine, has been elected to the American Society for Clinical Investigation (ASCI). A formal induction ceremony for new ASCI members will be held in April in Chicago. Ramalingam, who is the Roberto C. Goizueta Distinguished Chair for Cancer Research, is an internationally recognized lung cancer physician-investigator. He serves as Winship's director of medical oncology and its Lung Cancer Working Group, and he currently co-leads Winship's Discovery and Developmental Therapeutics Research Program. Ramalingam chairs the Thoracic Malignancies Committee and serves as deputy chair for the Therapeutics Program within ECOG-ACRIN, a National Cancer Institute-supported national clinical trials network group. His research focuses on development of novel anti-cancer agents and ways to individualize therapies for patients with small cell and non-small cell lung cancer.